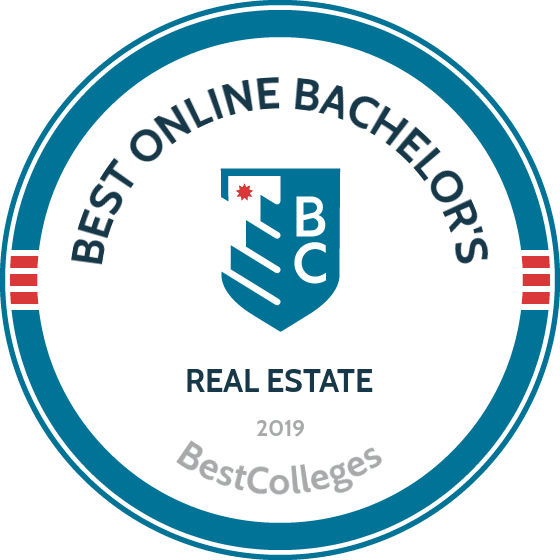 What Are The Best Online Bachelor's in Real Estate Programs? What Else Can I Expect From an Online Bachelor's in Real Estate Program? Earning a real estate degree online will help you launch your career as a broker, agent, property manager, or assessor. It also prepares you to pursue a graduate degree in business or law. While a bachelor's degree helps brokers advance their careers, the degree is required for property assessors and real estate lawyers. At some schools, real estate is an optional concentration for finance or business majors, while other schools offer a real estate major. The Bureau of Labor Statistics projects an 8% employment growth for real estate professions, making now the perfect time to earn a real estate degree online. Degrees in real estate emphasize practical coursework to prepare students for careers in sales, finance, and property management. The degree also lays the foundation for law school and a career as a real estate attorney. Although real estate as an academic discipline falls within the fields of finance and business, some schools offer stand-alone real estate majors due to the significant changes occurring in the industry. Other institutions offer degrees in business or finance with a concentration in real estate. Online real estate programs include classes in property management, which cover contracts, leases, maintenance, and property manager duties. Coursework in real estate economics and finance teach students about markets, taxation, mortgages, and real estate fees. Classes in real estate law prepare students for law school, and classes in taxation and valuation provide knowledge required for finance-related real estate careers. Founded in 1831, New York University is one of the largest private universities in the United States. Of the country's more than 3,000 colleges and universities, NYU is one of only 60 institutions belonging to the Association of American Universities. NYU initially enrolled only 158 students; the university now enrolls more than 50,000 students across its three degree-granting campuses, located in New York City, Shanghai, and Abu Dhabi. The university also boasts study-away sites in Asia, Africa, Australia, Europe, South America, and North America. NYU provides fully online programs, including an online BS in real estate. Students earning the real estate degree online prepare to manage industry change driven by evolving conceptualizations of urban landscapes. The curriculum provides a liberal arts and business foundation and emphasizes cutting-edge industry trends. Students complete 128-130 credits of coursework, including 32-34 credits of core courses, 16 credits of liberal arts electives, 16 credits of required courses, 44 credits of required real estate classes, 16 credits of real estate electives, and a four-credit graduation project. Course topics include real estate finance, business organization and management, and market analysis in real estate. For their graduation project, students can complete a seminar or internship in real estate. The University of West Georgia began as a district agricultural and mechanical school in 1906. The university later became a two-year college and has been a four-year institution since 1957. UWG offers several online degrees, including a bachelor of business administration with a major in real estate. Students pursuing the real estate degree online prepare for a variety of careers in sales and marketing, investment analysis, mortgage banking, and commercial and residential real estate. The curriculum includes 120 semester hours in coursework that covers topics including income property appraisal, strategic management, real estate finance, and real estate investment. Students complete about 80% of degree requirements online and fulfill the remaining requirements through on-campus courses. Applicants must submit a $40 application fee, official high school transcripts, and SAT or ACT scores. Freshman applicants must have completed prerequisite coursework in science, english, math, social science, and a foreign language. Because of UWG's fee structure, nonresidents can save money by completing a higher percentage of coursework online. UWG holds accreditation from the Southern Association of Colleges and Schools Commission on Colleges. Additionally, the Carnegie Classification of Institutions of Higher Education awards UWG the doctoral research university R3 classification. Only seven other Georgia institutions qualify for doctoral research university status. Situated in a quiet, residential neighborhood in Memphis, Tennessee, the University of Memphis is a major research institution. Founded in 1912, the university enrolls more than 21,000 students each year. The university promotes diversity, with students and faculty from all over the world. UofM offers more than 250 bachelor's degrees, 54 master's degrees, and 26 doctoral degrees. In addition to campus-based programs, UofM offers online options including a BBA in finance with a concentration in real estate. Finance students gain the basic analytical tools, concepts, and principles they need to make effective decisions in the field. The real estate concentration prepares students to pursue careers in real estate and related fields, such as banking, mortgage, and real estate development. Students earning the real estate bachelor's degree online complete 120-122 hours of coursework covering topics including real estate principles, business communications, global information technology, and commercial banking. Applicants must submit official high school transcripts. UofM delivers online distance education programs fully online and requires no campus visits. The university boasts five state-approved Centers of Excellence and 25 Chairs of Excellence. UofM holds accreditation from the Southern Association of Colleges and Schools Commission on Colleges, and the finance department is accredited by the Association to Advance Collegiate Schools of Business. Based on a scenic campus in Clarion, Pennsylvania, Clarion University of Pennsylvania began as a seminary in 1867. Today, the university offers more than 100 academic programs, boasts more than 150 student organizations, and serves a diverse body of students from 45 states and 10 countries. The university also offers online degrees, including a bachelor of science in business administration in real estate. Students earning the real estate bachelor's degree online develop the skills and knowledge they need for careers in appraisal, finance, development, real estate brokerage, property management, and investment analysis. The program integrates hands-on experiences and community field projects, during which students apply classroom theories. Graduates meet the educational requirements to obtain broker and salesperson licenses in Pennsylvania. Students take courses including managerial accounting, financial accounting, and economics and business statistics. Of Clarion's faculty members, 90% hold a terminal degree in their field. Learners can pursue on-campus certifications in real estate appraisal and real estate brokerage. Clarion offers discounted tuition rates for online students, and in-state learners receive additional discounts. The university offers merit and endowed scholarships for students who meet certain criteria, such as those pursuing a specific major, who demonstrate a history of community involvement, or who excel academically. Clarion University boasts 28 national accreditations, and the institution holds regional accreditation from the Middle States Commission on Higher Education. Selecting the right online real estate degree is a personal decision. Some schools offer degrees in finance or business with a concentration in real estate, while others offer a dedicated real estate major. Students should consider their academic and career goals before choosing a program. Real estate degree requirements vary by program. Some programs emphasize business or finance, and others focus on practical skills necessary for real estate careers. Required coursework depends on the department's objectives, but below are classes found in most online real estate degree programs. Principles of Real Estate: This basic course introduces students to the discipline and covers the fundamentals and vocabulary of real property investment and management. This class helps students meet the academic requirements for state licensure in real estate sales. Real Estate Law: This course covers real estate's legal relationships and instruments and provides an academic foundation for students in finance, pre-law, paralegal studies, or property management. Topics include zoning, environmental regulations, wills, and contracts. The course reviews property investment, ownership, purchase, sales, and inheritance laws. Real Estate Appraisal: Essential for future assessors, this course focuses on real estate appraisal techniques. Some schools divide the course into two sections: investment property and residential property. Both classes cover the concepts and principles of market value and its effect on economic, social, and political life. Real Estate Finance: This course provides a comprehensive look at the real estate industry's financial institutions. Students discuss mortgages, investment loans, property value, foreclosure, and purchase cost, as well as general theories of real estate finance. Real Estate Management: Fundamental to understanding property management and related careers, this course serves as the capstone for some real estate degrees. Topics include property maintenance, community management, and real estate marketing. Students learn fundamental management principles, such as strategic decision-making, program evaluation, and problem-solving strategies. HOW LONG DOES IT TAKE TO GET AN ONLINE BACHELOR'S IN REAL ESTATE? Real estate degree online programs require at least 120 credits — four years of full-time study. Accelerated programs allow students to take one course every five weeks or two courses every eight weeks throughout the calendar year. Real estate students typically take about 60 credits in general education courses, with the remaining credits comprising electives and major courses. Degrees in finance or business with a concentration in real estate include courses in both business and real estate. Prospective students should consider whether individually paced or cohort-based learning best fits their lifestyle. Students in individually paced programs complete coursework at their own speed. Students in cohort-based programs, on the other hand, move through the program in small groups. Students pursuing a bachelor's in real estate degree online should look for regionally accredited schools. Six regional accrediting bodies accredit academically oriented institutions in the United States. Law schools, business schools, and state licensing committees typically require a degree from a regionally accredited institution. National accrediting bodies focus on career-oriented programs. Many business management programs at regionally accredited schools also hold national accreditation with the Association to Advance Collegiate Schools of Business, the International Assembly for Collegiate Business Education, or the Accreditation Council for Business Schools and Programs. Ideally, schools offering an online real estate degree should hold regional and national accreditation. The U.S. Department of Education (ED) and the Council for Higher Education Accreditation (CHEA) recognize regional and national accrediting bodies. The ED oversees U.S. schools and the enforcement of educational law, including reviewing accrediting agencies. CHEA is a private organization composed of degree-granting colleges and universities and recognized accrediting agencies. Students can find a list of all accredited schools on the ED and CHEA websites. The growing field of real estate offers career options in sales and with mortgage companies and law firms. Earning a real estate degree online prepares students to work as agents or brokers, property managers, and real estate paralegals and lawyers. These professionals help people buy, sell, and rent residential and commercial property. A broker holds a license to manage a real estate business, and an agent works for a broker. Brokerage firms prefer employees with a bachelor's degree in real estate. Appraisers and assessors visit properties to determine the value of land or buildings before a sale, construction project, or tax assessment. Appraisers and assessors are certified, which typically requires a bachelor's degree. Property managers work in residential, commercial, or industrial settings. They are responsible for a facility's external appearance, maintenance, marketing, sales, and residential or customer service. Experienced construction workers with a degree in real estate may become inspectors, who review new construction and existing properties to ensure they meet zoning requirements, local ordinances, and contract stipulations. Most states require certification. Real estate lawyers represent the needs of buyers, sellers, agents, and mortgage companies. They may begin their careers as paralegals or real estate agents or may launch a career in this specialized field after passing the bar exam. Graduates of real estate degree programs can expect above average job growth. Salaries of real estate professionals vary by workplace, experience, education, and geographic location. The following table highlights the five highest paying states for real estate brokers and agents. An online real estate degree can be surprisingly affordable, but most students still need help financing higher education. Fortunately, federal and private financial aid programs are available to help students pay for their degrees. Begin by completing the Free Application for Federal Student Aid (FAFSA) to determine your eligibility for federal scholarships, grants, loans, and work-study programs. Many institutional and private funding opportunities also require the FAFSA.